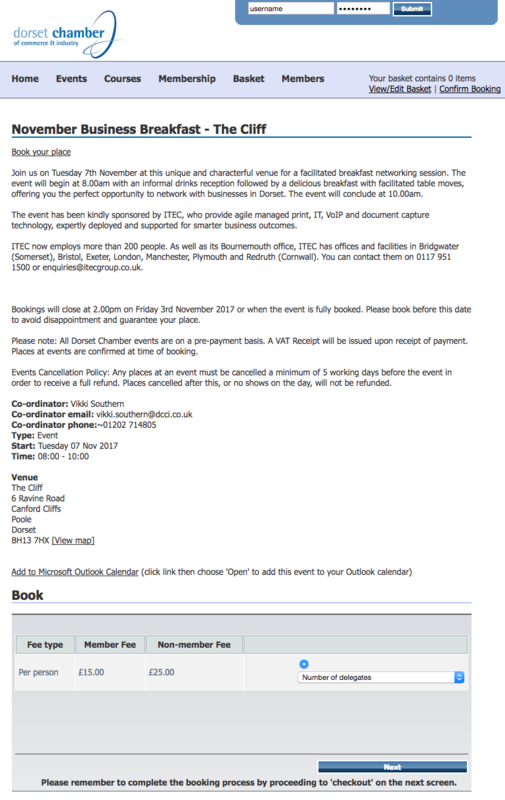 How do I book onto a Dorset Chamber event? 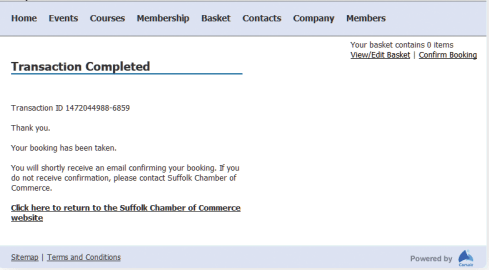 To book a Chamber event, please select your chosen event from the Events section of the website and click ‘book now’. Please note that you must be logged into the website prior to making the booking to receive your member discount rate. You will be directed to the event booking system where you can complete the booking for your chosen Chamber events. 2. You will be asked to indicate the number of delegates you wish to book for, your contact details and any dietary or other requirements you may have. 3. Once you have completed the booking form, click ‘Next’. 4. The event booking will be added to your basket, so you can either book another event, or complete your booking and move on to the confirmation screen or payment screen if the event has a booking fee to pay. 5. 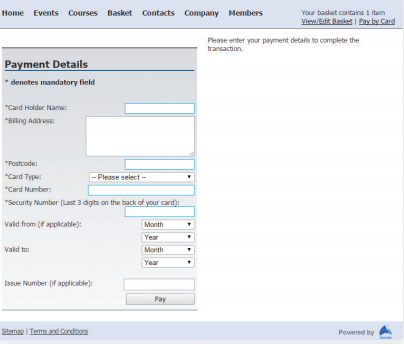 Once your payment has gone through this will be confirmed as shown by the screen below, after which you will also receive a confirmation email. On this page you need to enter your email address and click submit. If your email is recognised you will receive a link in your email, please click this link. On the following page you need to enter a new password. This needs to be 8 characters or longer. Once entered click submit. Your password will be changed. Please navigate back to the homepage within the mychamber portal. If you forget your new password, you can follow the steps above to reset it. Please note that Chamber staff will NOT have access to your password, so you may wish to keep a secure record of it. If you are having problems with your username, please contact us on 01202 714800 and a member of staff will be able to help you. I'm a non-member how do I book onto an event? At Dorset Chamber we welcome non-members to many of our events. To book simply click the ‘book now’ button of your selected event on the main Dorset Chamber website and you will be taken to the MyChamber booking portal. 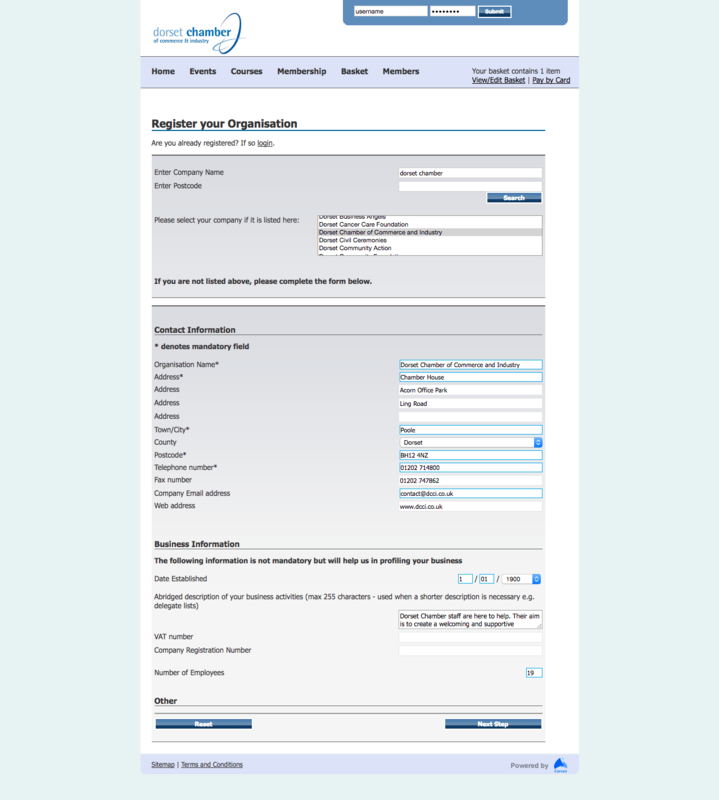 Enter your information including any dietary requirements and number of delegates and then click ‘next’. This has been added to your basket and you know need to click ‘pay by card’ to progress and make payment. On the next screen you will be prompted at the checkout screen for your ‘login’ information or to sign up. As a non-member please enter your company name. If your company name exists in our system it will autofill the information about the company on the next page. If not you will be required to enter this information. Please note that you will only ever be required to enter this information once as you will get access with the login information for any future bookings. Once the information has been entered click the ‘next step’ to progress to enter your contact information and then proceed to make payment. You can then make payment by entering your details and a confirmation email will be sent to you.